Create healthy juicing recipes to fit your own health needs. Remember, any juicing recipe is so much better when what you are juicing is rich in trace minerals. 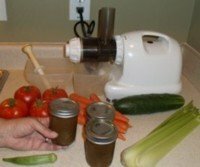 In developing your own healthy juicing recipes, a good place to start is with some good basic juicing vegetables: tomatoes, cucumbers, celery and carrots. After all, most people already have them in their refrigerators, and they contain a lot of great nutrients. Green leafy vegetables are excellent to add next. These include spinach, kale, swiss chard, collard greens and cabbage. Compared to other vegetables, green leafy vegetables have the fewest calories and the most nutrition. However, to avoid a stomach ache, don't add too much at first, then proceed cautiously to allow your stomach to get used to them. Third, in developing your own healthy juicing recipes, you might add a bit of these: Asparagus; Beans, peas and lentils; Peppers, Broccoli and Brussels sprouts, and Dandelion greens. See which ones you like the taste of best. You have just developed a super juice! Now try throwing in a bit of fruit. Variety is the spice of life, and nutritionally speaking, juicing a wide variety of items helps to supply your body with a broad base of nutrition. It can also add some nice flavor. I personally like to add a peach, or some cantaloupe or watermelon to our juice. Look through the list of 120 juicing items and try a few new ingredients to add to your juice from time to time. Then enjoy the end result of your juicing endeavor - EXCEPTIONAL HEALTH!!! Are you interested in doing a juice fast? Be careful. Most vegetables have very little protein and virtually no fat, both of which need to be a part of a balanced diet. So unless you are going through a short-term juice fast or detoxification program, consider adding items with protein and fat to your healthy juicing recipes. Coconut oil, Raw cream, Raw butter, Raw eggs, Avocado, Nuts, Seeds, Freshly ground flax seed, and Legumes (like peas, beans and lentils) are good sources of fat and protein. Any fruit that may be eaten may be juiced. Fruits are always a great choice for added natural sweetness, though this sweetness means less weight loss and more fructose. Therefore, those who are trying to lower their blood sugar or their uric acid might not want to add much fruit when formulating their own healthy juicing recipes. The exception to this is citrus fruits. They don’t have much sugar, and bring a hint of tart flavor to the juice. Make sure and remove hard pits and hard seeds before juicing fruit. A sprout is simply a very young plant that might grow to maturity if it were not eaten. Sprouting a seed increases the available nutrients in the seed. Sprouts are the easiest vegetable crop to grow and certainly the most nutritious. Any edible seed that produces a nonpoisonous plant can be sprouted for use as food. Seeds might include grains, nuts, legumes, and many vegetables. However, any vegetable related to the potato or tomato sprouts should not be eaten, since their leaves and stalks are toxic. Popular sprouts are sunflower, green gram, golden gram, buckwheat, clover, mung bean, quinoa, soybean, and broccoli. So sprout those seeds and release an avalanche of nutrition by adding sprouts to your healthy juicing recipes. Micro-greens are seedlings that are harvested either when the first leaf or second leaf appears. After planting, it generally only takes 2 to 3 weeks until micro-greens are ready to be harvested. Here is a short list of plants that do well when grown as Micro-greens, which can then be juiced: Amaranth, Arugula, Basil, Beet, Broccoli, Cabbage, Celery, Chard, China Rose Radish, Chives, Cilantro, Cress, Diakon Radish, Endive, Fennel, Garlic, Green Pea, Mizuna, Mustard, Onion, Pac Choi, Purple Cabbage, Radish, Snow Pea, Sunflowers, Tokyo Bekana, Yellow Pea. 1. Garden produce is super fresh. Pick it when you need it. 2. You can grow nutrient dense plants through healthy vegetable gardening. 3. When you add sea mineral micro-nutrients to your garden, it loads them with a full spectrum of trace minerals. 4. Your ultimate goal is for food to become your medicine! I hope that this gives you a guideline in developing your own unique healthy juicing recipes. May your ailments disappear, and may God grant you health and strength for the rest of your life.